It must have been about 30 years ago, because Robert Sjoberg, SM ’81, made me do it. Actually, that first edition of How to Speak drew about 100. This past week about 250 showed up. It’s a little hard to say exactly because 6-120 officially seats 150 and perhaps another 100 sat on the stairs and floor or stood in the back or watched from the hall. Some elements of the talk were the same that Robert heard that first year. Start with an empowerment promise, something everyone will be able to do at the end that they are not able to do at the beginning. Finish with a reminder that you have delivered on your promise. Avoid thanking the audience, because that suggests insecurity, but exit with a joke, if you can, because that way people will think they had fun the entire time. There is much more now, of course, because I keep learning new things. I’ve added techniques for passing oral exams, delivering successful job-interview talks, and ensuring that ideas become as famous as they ought to be. Some say How to Speak has become an MIT tradition. I think of it as an exemplar of the spirit of IAP: people in the MIT community taking care of their own and having fun doing it. It is highly nonlinear, of course. I imagine that everyone in the audience is empowered by at least one idea, and that may be the idea that improves a talk that lands a job that enables a high-impact career. By now, more than 5000 people have heard How to Speak. Pretty good return on the 10 minutes it took Robert to talk me into doing it. 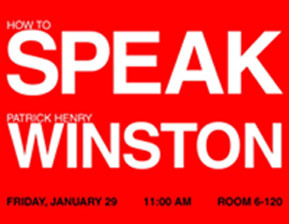 Editor’s Note: You can hear a version of Prof. Winston’s talk (recorded by Harvard). I just learned something really important about MIT students, and I had to leave the campus to find it out. Actually, it wasn’t so much that I left Cambridge—I was at a Salvation Army conference center in Sharon, Massachusetts—as it was that I turned off my Blackberry, gathered together with students, administrators, faculty, and alumni, and I listened. For six days. Leadershape students begin a yearlong experience. I was at a program called LeaderShape with 61 undergraduates. The goal of the program is for students to develop leadership skills and competencies. We want them to focus on the task at hand, so the Division of Student Life covers all their expenses, including transportation, food, and rooms. And the students are joined each year a dozen staff and faculty; this year the group included Institute Vice President Kirk Kolenbrander; Tracy Purinton of the MIT Leadership Center; and Alan Siegel, the chief of Mental Health Services from MIT Medical. It may sound a little retreat-ish, if you know what I mean, but this was different than I expected—and much more intense. We broke into five clusters, each led by two facilitators. Then, each group was asked to develop a community, creating visions for the future, constructing a blueprint for each of the student’s visions, understanding ideas like the value of one and the power of all and leading with integrity. The official schedule called for 15-hour days, starting at 7:30 a.m. with formal exercises until 10 p.m., but in true MIT fashion many of the students continued the conversation until the early morning. I was amazed at how hard the students worked, their creativity and their passion. We know this about MIT students, but I was also astonished to hear them open up, to see how much pressure they put on themselves to succeed, and to take in how important it is for them to make a difference. It was powerfully moving—and I realized how much it matters that they feel connected to each other, to alumni, and to those of us who help shape their time at MIT. Over six days and hours and hours of talking and listening and sharing, we bonded. When I got back to campus, I was exhausted—not by the time, but by the depth of the experience. Someone has created a listserve and email messages have been going back and forth. And I can’t step into the Infinite Corridor now without hearing a student call my name to say hello. I’ll go again. It will be just as intense and just as exhausting and just as important that I learn these things all over again. Plating a dish in the kitchen of the French restaurant Daniel, a top eatery in New York (© Owen Franken). Looking for Mad Max with a Brass Rat…Is that You? On the show, John Cohn ’81 (above) built numerous devices to aid the colonists' survival, including water purifiers, a wood-powered electric generator, and flame throwers. The opportunity to spend all day inventing on the fly was, despite the conditions and some reality-TV drama, one of the most fun and relaxing things he's ever done. Photo: Discovery Channel. Ever wanted to be on TV? Here’s your chance! Last year I was a cast member on The Colony, a new science/survival/reality show on Discovery Channel. The show simulates a post-apocalyptic world in which a small group of people is isolated in a constrained setting and has to innovate in order to survive. Think Survivor meets MacGyver. Watch video from the show to get a feel for the setup. Last year, 10 of us were isolated in an abandoned steel mill in East LA for 58 days. We had to develop ways to purify water, find and prepare food, generate electricity, communicate, and even defend ourselves from simulated attackers using just the materials we could find. The experience was not for the feint of heart—we worked long hours; ate, drank, and slept very little; and were perpetually dirty. But even so, it was one of the most incredible experiences of my life on both a technical and personal level. Reaction to the series was very positive. Discovery called it a “surprise hit” and are now casting for season two. They’ve asked me to help find the perfect mad scientist type. Do you have mad talents like circuit hacking, welding, woodworking, and fire skills? Do you have crazy survival tactics? Leadership ability? What do you think you’d bring to a post-apocalyptic world? We’re looking for Mad Max with a brass rat. Is that you? If so, please contact me johncohn@alum.mit.edu and visit Metal Flowers Media and get your application in right away. Also, feel free to contact me if you have any questions. I’d love to see another person from the ’Tute show the world what it takes to survive the big one! The Discovery Channel invites you to participate in an extraordinary, once-in-a-lifetime experience: in the second season of this critically acclaimed docu-reality series deemed a social experiment, a group of eleven strangers must co-exist in a simulated, post-apocalyptic world. The world as you know it is gone there is no water, no food, no communication, no power. Its now up to you and eleven strangers to fend for yourselves as you rebuild society and re-engineer the world as you once knew it. If you understand the science of survival, if you have a skill that would help you and others survive after a catastrophe, if you are ambitious, motivated, resourceful under pressure and willing to un-tap your personal ingenuity, we are looking for you. Join us in this true test of the human spirit. Must have TANGIBLE survival skills and big personalities. In honor of the upcoming national Engineers’ Week, February 14–20, Cohn put together and stars in this humorous rap parody to remind folks that engineering is wicked cool. Also check out Cohn’s blog, which he began as a way to help cope with the death of his 14-year-old son, Sam, killed in a 2006 traffic accident. How Will Consumer Choices Impact China’s Emissions? I am in Beijing for five months interning with the United Nations Industrial Development Organization (UNIDO) through the MIT-China Program. UNIDO works with various developing countries to develop more sustainable industrial practices while maintaining economic growth. My project in China will study carbon emissions standards for consumer products. 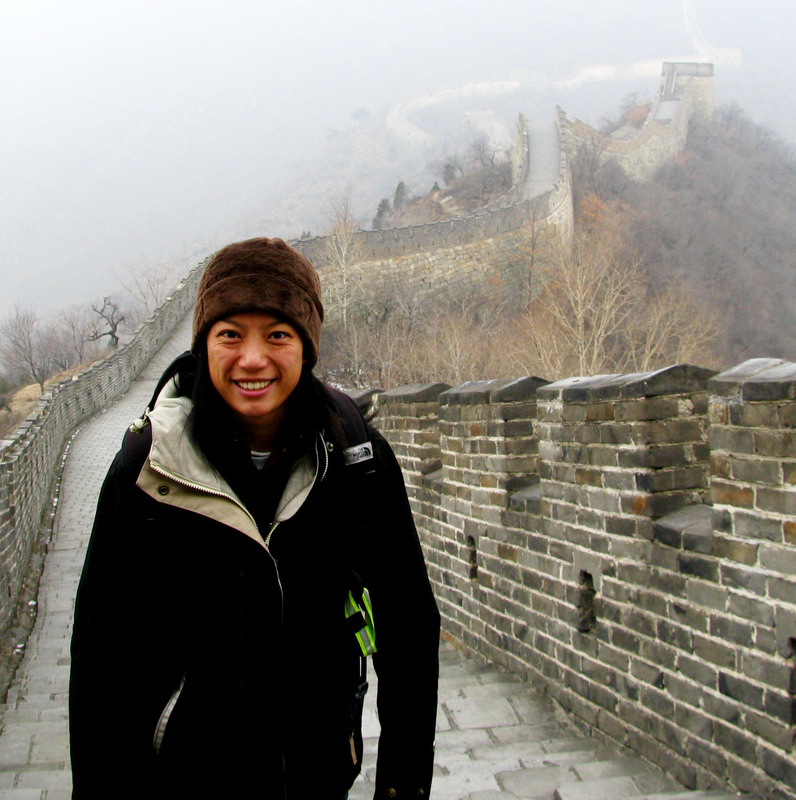 Shan Wu visiting China's Great Wall. As global climate change awareness increases, consumers are becoming more and more environmentally conscious. From eating organic foods to recycling to purchasing responsible and green products, many of us are making deliberate life-style decisions and changes to reduce our personal carbon footprint. These changes in global spending patterns are also starting to take hold in developing countries like China. A bigger and more immediate impact, however, lies in how changing consumer sentiments in the West will affect China’s massive import and export industries, worth $1,133 and $1,428 billion dollars respectively in 2008. Toward answering this question, one big challenge is the lack of global measurement standards for determining a product’s carbon footprint. This makes comparisons between Chinese products, Western products, and potential import and export restrictions based on environmental impacts difficult. My internship with UNIDO will be to develop recommendations for measuring product carbon emissions in China and how to apply them within the trade industry. China, in collaboration with several frontrunner organizations in Asia and Europe, has already developed voluntary environmental certification standards for a variety of products ranging from household appliances to writing instruments. Thus, the first goal of my project is to evaluate how these standards compare to international ones as well as to determine how the standards can be expanded to include carbon emissions footprints in the certification process. The second goal of this project is to establish recommendations for what roles the environmental and carbon impacts of a product should play in China’s trade agreements with the rest of the world. My long-term career interests are in science policy and particularly energy policy. I am extremely grateful to have this tremendous opportunity through MISTI and the MIT-China Program to be in Beijing and to work in an area immediately relevant to my career development. Alumnus Sends First Tweet from Space! 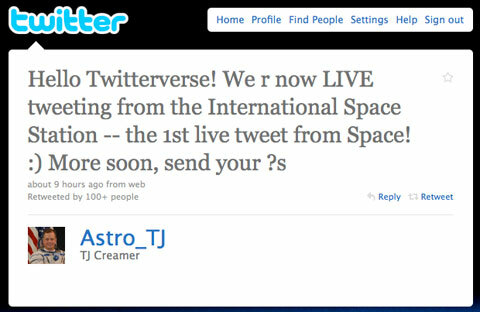 On Friday, the New York Times reported that MIT alumnus Timothy Creamer had sent the very first tweet from space. Creamer SM ‘92 has been aboard the International Space Station since late December. Read more about Creamer’s mission on the space station and follow him on Twitter @Astro_TJ.